see our article on squats and deadlifts and how to do them to avoid injury. See which are the most common injuries we see and the simple things you can do to avoid them. There are hundreds of joints extending from your neck to tailbone and rib cage. Movements during training that overstretch or overload joints can cause joint sprains and strains. These are common and can range from the mild irritation to debilitating pain. Most patients can make a complete recovery from most these when treated. Untreated they could remain problematic for long periods or become areas of reoccurring injury and pain. Like spinal joints, the two large joints either side of your tail bone in your pelvis can be sprained or strained during training. The job of the sacroiliac joints can be very complex. They must bear weight and control movement at the same time. As the name implies overuse and repetitive movements can cause injury almost any tendon. Repetitive use causes rubbing and irritation that can cause inflammation. In some cases this leads to bursitis which can easily become chronic. Tendonitis with bursitis almost always requires rest and treatment or rehabilitation. 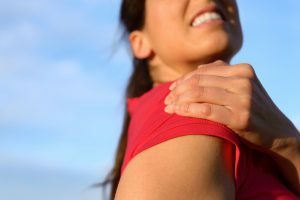 The shoulder has a large range of motion but it generally not a very stable joint. This large range of motion makes it susceptible to chronic muscle strains, tendonitis’s, bursitis. These conditions in this area can often become chronic and can be difficult to manage. These are a common traumatic sports injury. Rolling an ankle can be just bad luck but ankles need specific rehabilitation. Bad sprains can leave ankles week and susceptible to re-injury with simple activities. Many ankle strains over a period of time need specialized rehab. Are common sports complains and can often be the result of problems with form and technique. Tight and inflexible muscles, improper warm up can also be the cause. Overloaded weights training are another way these strains can occur. Poor techniques, physical trauma and overstrain of muscles around the knee can lead to many different knee injuries. Some such as patella (knee cap) tracking disorders can respond well to rehabilitation. More severe knee injuries sometimes need surgery and extensive rehabilitation to return to exercise. Knee injuries need thorough examination and investigation to be property diagnosed and treated. This is all about GOOD TECHNIQUE and knowing your body! As an Osteopath I have an excellent understanding of biomechanics – which is how your body moves. 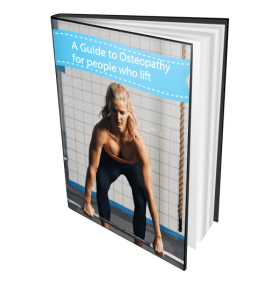 It is easy for an Osteopath to asses your movement and recommend what exercises are or maybe are not suitable for you to do and what are good alternatives. This combined with a trainer can put you in a good position to train in the safest way possible way. This is when you can gain great results from your training with less chance or getting injured. Knowing any limitations from previous injuries and concentrating on posture, technique and form. Getting advice from trainers no matter what your level is really important. Not only will this knowledge decrease your risk of injury but it also help you to simply focus on your training and getting results without getting injuries. As you increase distance or weight you should also always be striving for improvement in technique. Don’t do too much too fast. You would think this is most common to beginners but that is not always true. Sometimes more experienced exercisers misjudge where they are with strength and fitness. I often see very fit people underestimating the core strength required to get them to the next level in their training. Too much weight or distance too quickly can set you back severely. Overtraining and not allowing the body adequate rest periods can exhaust the body. Draining the body’s energy and not allowing time to recover and repair after can set you up for injury. Most people are guilty of not doing this one at some point. Warm up exercises are usually done with the aim of increasing the blood flow to the muscles. The increased blood flow makes them more “pliable” and adaptable to exercise without injury. Warm up exercises are generally high-rep, low-intensity – a light jog, cycle etc. Lifting weights without a warm up is putting you at a much higher risk of injury no matter how fit you are. If it hurts, STOP! Pushing through pain (especially sharp or pain you have not had before) is not good. Pushing through fatigue for resistance training is how you progress. After an intense weights session a stretch or a foam roller can ease minor soft tissue strains. A good trainer can help you identify the difference between pushing yourself to the next level and pain due to tissues being injured. I often see patients who have been pushing through the pain not realising the damage they are doing. Continuing training with tendon injuries can cause tendonitis that can be difficult to rehabilitate. It is a similar story for stress fractures. Often the body has been trying to tell them for quite sometime that it cannot deal with the loads being applied. These injuries are far more common than people realise. If identified early they have much better outcomes. Ok so there’s lots of different schools of thought on this one. One minute it’s essential before and after all exercise. Next minute a researcher will claim there are no beneficial outcomes. What I do know from years of treating injuries is that not stretching at all will not help your performance. Not Stretching at all will probably put you at a much greater risk of hurting yourself. Properly performed, a stretch helps to elongate, increase circulation and warm up a muscle. Warmed up muscles are more pliable and ‘alert’. in my experience this makes it far more injury-resistant. Post exercise muscle soreness is reported less when muscles are stretched after a workout. Yep I’ve come across body builders that don’t stretch ….. like ever!! I often find not only do they have injuries but they can be very unbalanced with their strength and flexibility. They may be able to lift very heavy weights but some simple activities can easily cause strain in them. In my experience, the best performing bodies have a perfect combination of strength and flexibility. These bodies tend to recover well from injuries. Ive seen countless people wanting to lose weight who consume too little or the wrong type of food. They continue to try to train hard and frequently. This is a great way to get injured. If you want to perform better or gain muscle bulk diet is important. Getting advice from a sports nutritionalist on what to eat is worthwhile. You need to provide your body with the best fuel possible if you want it to perform well. If you are doing resistance training you need to ‘feed’ your muscles. Optimal nutrition can feed your muscles and help them recover from a work-out. Get the right advice from the beginning. Have a team around you to know exactly what your body can (and probably should not) do and how to do it correctly. At the first sign of injury get it assessed and treated. Follow the proper management from the beginning to avoid injuries setting you back. There is no way I can know if this applies to you and your specific situation. How could I? I don’t know who you are … what your medical history is … what you do…. or how you use your body. This post, therefore, is in NO WAY a substitute for thorough diagnosis and assessment by a qualified health professional. If you’ve got pain then it’s my responsibility to recommend that you consult with a professional who is qualified to diagnose and treat pain … and someone, preferably, who knows and understands how you like to exercise and won’t just tell you to ‘stop it’ … especially when you might just be able to use it to get better!